Happy last Monday of March. This was a special month. 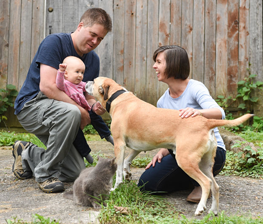 We marked 7 years of living here at the farm. And we marked Matt’s 40th birthday. There was lots of time with family, more sunshine and warmer temperatures. It feels like we have finally turned the corner into spring. The skating rink that was our driveway has turned into a mud strip. We tapped some maple trees to make syrup. The skating rink that was the pond is melting. I was down at the pond one morning last week and discovered that there is some serious construction going on down there. We have beavers again and they are building lodges and taking down trees all around the pond. (When we first moved to the farm, I spotted a beaver one night… and I think I’m just as excited now as I was then.) I shared a video on my stories (it’s saved in my highlights). To cap off the month, I’m sharing another round-up of some interesting things I’ve come across recently. Baxter’s coyote encounter is very fresh for us. This video of a dog playing with a wild coyote, is a nice counterpoint to our violent incident. In other unlikely wildlife-dog news, this dog made friends with a wild deer. 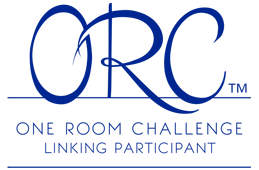 The One Room Challenge kicks off next week. I’m actually thinking about participating, albeit on a really small scale. I’ve been ever so slowly been cleaning out the dining room to prepare for painting. I’m thinking the ORC might be helpful to keep me on track and actually get this project done. (See my previous ORC projects: the laundry room, master bedroom and my office.) Are you participating? We have a pretty quiet week ahead. I’ll be working on a few freelance writing projects, and Matt has one appointment. Hmm, maybe I can get a headstart on the dining room. How are you finishing off March? Did you have any special celebrations this month? What’s been inspiring you? Any unlikely animal pairings to share? This is shaping up to be a very busy week for us actually! I’m using my planner to keep my thoughts straight. Ah. The “my brain is full” syndrome. I know it well. Good luck with everything on your list. Blitz and Ruff seem to have such a special relationship. I didn’t realize he only likes Ruff. That’s really special. March has been pretty intense for me since I’ve been working on moving out of my old house and in with a friend. It’s always interesting to find out how much stuff one owns…lol. That being said, I’m ready for a vacation!! Can’t wait to get away for 10 days in April. Oy. That is intense. Through the process of cleaning out just the dining room to prep for painting, I filled 3 boxes of donations. I can’t imagine doing our whole house! You definitely will earn your vacation.